It takes 5 hours and 15 minutes to drive from South Carolina’s westernmost town of Long Creek to the east coast city of Myrtle Beach. Fort Sumter in Charleston was the first battle site of the Civil War. Shots were fired on April 12, 1861, by confederate soldiers, and the battle lasted through the day. Confederates then surrendered on April 13, as their supply line had been severed. Main Street in Greenville is crawling with nine tiny mice sculptures, hidden in the stretch between the Hyatt and the Westin Poinsett Hotel. “Mice on Main” is the brainchild of Jim Ryan, who got inspired from the nine mice hidden in the children’s book Goodnight Moon. There is a graveyard in the median of I-85. Around exit 95, upon a grassy knoll, there are eight marked headstones dating back to the 1800s. Unfortunately, this is a very busy section of the interstate, so proceed with caution. A nuclear bomb was accidentally dropped from a plane at Mars Bluff near Florence in 1958. The impact of the explosive left a large crater spanning 75 feet in diameter. Luckily, no one was injured, though several people sustained injuries. There are three drive-in movie theatres still operating in South Carolina: The Auto 25 Drive In in Greenwood, Highway 21 Drive In Movie Theater in Beaufort, and Monetta Drive In Theater in Monetta. South Carolina is no strangers to the lights, camera, and action of Hollywood. Areas throughout the state provided backdrops for blockbusters like “The Patriot,” “The Notebook,” “Deliverance,” and HBO’s “Eastbound and Down.” Several shining stars have also called this state home: Vanna White, Mary-Louise Parker, Anna Camp, and Stephen Colbert, to name a few. Hollywood scenery isn’t South Carolina’s only claim to fame. This state has also produced some top musical talent, like Hootie and the Blowfish, Edwin McCain, Dizzy Gillespie, Eartha Kitt, and Needtobreathe. The state’s first legal moonshine distillery, Palmetto Moonshine, is located right across from the courthouse in Anderson. They’ve got quite a history of making the stuff, too—long before it became legal! The owners, Trey and Bryan Boggs, are carrying on a decades-long tradition of a relative who ran a bootleg moonshine business. The only difference is now Uncle Sam gets his cut. South Carolina has its share of weird town names. You can visit places with names like Due West, Ninety Six, Lucknow, Spiderweb, Graves, Coosawatchie, and Coward. There is an authentic castle on Paris Mountain near Greenville. Built in 1902 for a German baroness, the castle had remained in the same family until 2010, when it was sold for just under two million. 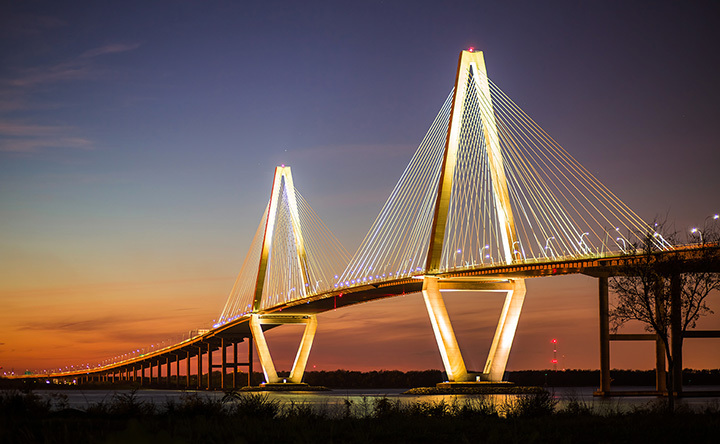 Some of South Carolina’s most recognizable landmarks are the Ravenel Bridge, Rainbow Row, the Angel Oak Tree, and Boone Hall—all of which are located in or near Charleston. South Carolina has no major professional sports teams. However, they do boast one of the best college football teams in the country—all hail the Clemson Tigers. Morgan Island is teeming with Rhesus monkeys. This isn’t a family-friendly destination, though. First of all, to gain access to the island, you have to be a monkey—no humans allowed (although you can kayak and fish close enough to the island to catch a glimpse of the primates). Second, these monkeys are being used in deep-dive research conducted by the National Institute of Allergy and Infectious Diseases. The colony has been around since the 1970s, and it continues to thrive with little intervention from the state.